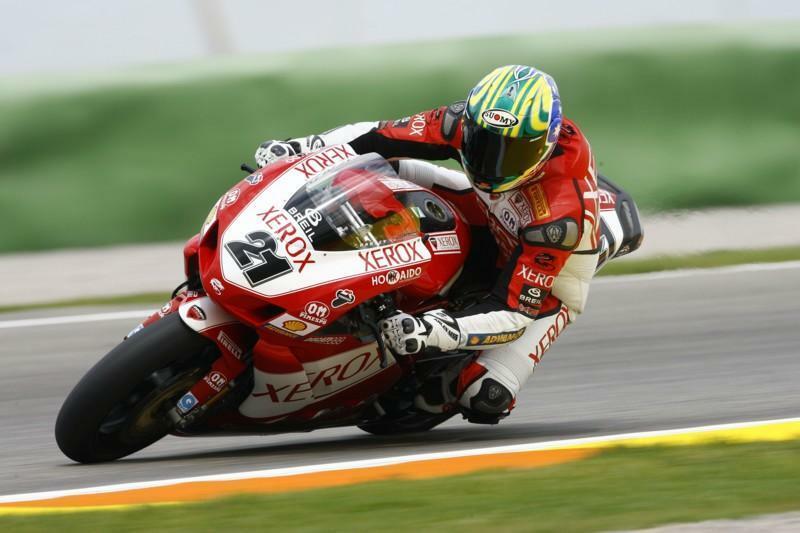 Troy Bayliss did the double at Valencia leading two identical podiums ahead of Troy Corser and team-mate Lorenzo Lanzi. Both races played out pretty much the same with Corser dominating the first half only to be caught by Bayliss, who was running a harder tyre which let him keep putting in good laps right up to the flag. Get your next bike here Corser fought harder in the second race drawing out a big lead and making Bayliss work really hard to get past, which he eventually did with only two laps to go. Lanzi put in a strong performance fighting his way through to third in both races but he admitted afterwards that he wasn't fast enough to run with the two Troys. Brit Chris Walker rode well in both races but a mistake in the first race saw him run in to the gravel and finish the race right at the back. Race two he managed to hang on to fifth for the entire race only losing out to Abe right at the very end. Join MCN's Fantasy Road Race Former champ James Toseland had a really bad weekend continuously struggling for grip. Despite sliding the bike out of every corner he managed to take 9th in the first race and just lost 10th place in race two to Michelle Fabrizio on the line. Sebastien Charpentier took another win for Winston Ten Kate in the Supersport race with a massive 6.5 second lead over second placed man Aussie Kevin Curtain. It was Katsuaki Fujiwara who took third place just nudging his fellow Yamaha rider Brock Parkes in to fourth with local wildcard rider Jordi Torres taking an impressive fifth.